Our scent sample vials not only let you experience our fragrances before ordering oils, but have other great uses as well ! 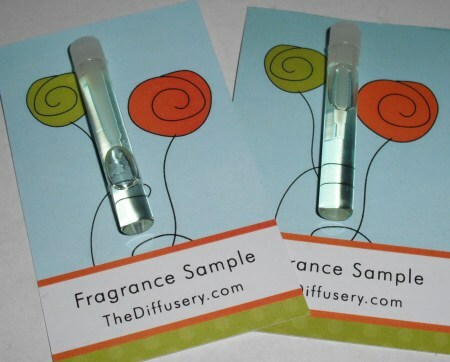 Our sample vials are filled with fresh, highly concentrated pure fragrance oil. These oils can be used to scent small batches of bath and body products, for making wax tarts, for scenting sachets or for use in light bulb rings. We have discovered that one sample vial holds just enough oil to fill the top of your aroma burners ! This is certainly an economical way to scent your house in a hurry ! Aroma Burner Directions: Place one vial (1.15ml) of fragrance oil into top of clean aroma burner. Light the tealight candle beneath it. You will start to smell the aromas as soon as the oil heats up. After 10 minutes, extinguish (blow out) candle. The scent lingers for a long time in the air. Caution: Never leave a burning candle unattended.